Posted August 6, 2013 in Uncategorized. 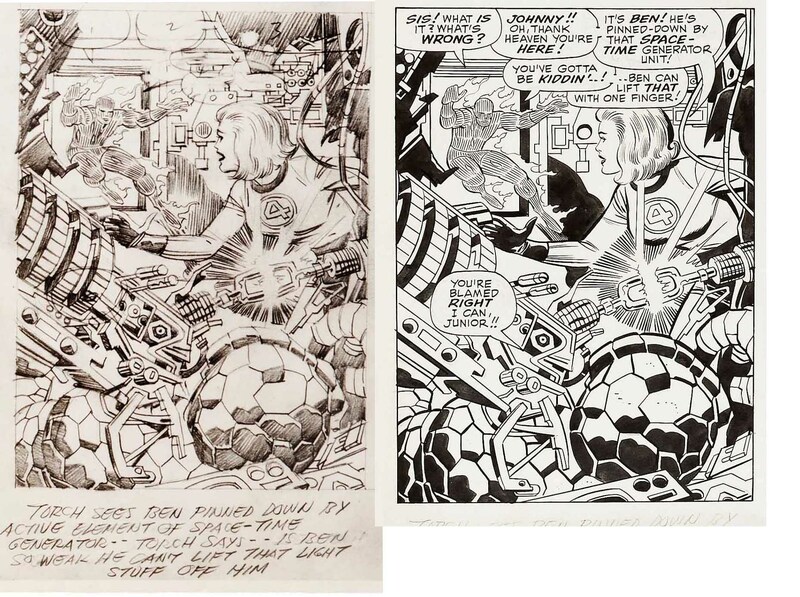 With increasing frequency, stat copies of Jack Kirby’s original pencils are appearing, giving those that study his art and storytelling abilities a wonderful opportunity to delve deeper into the King’s creative processes. 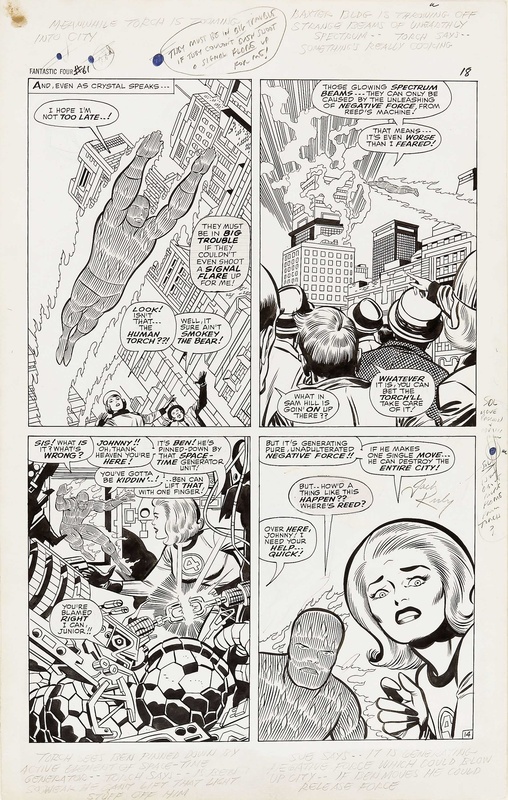 The original inked page from Fantastic Four #61 shown above first appeared at the Heritage auction site several years ago. 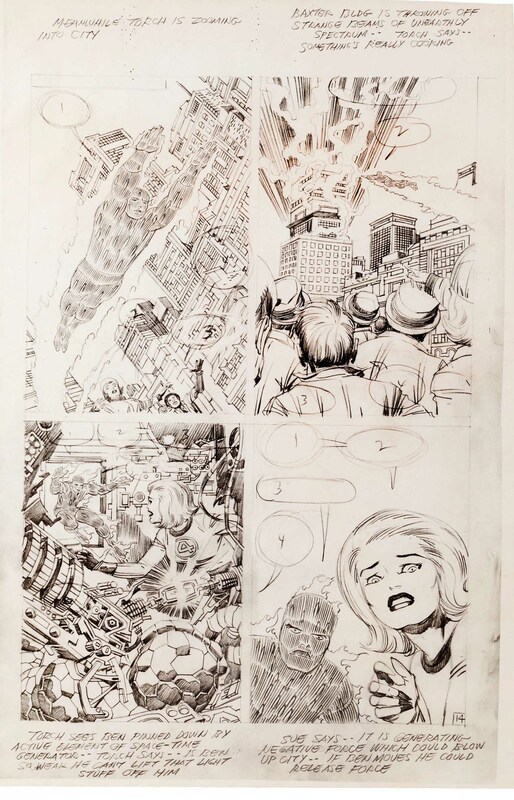 Then sometime early in August 2013, a full sized stat of the same page was sold by the same auctioneer, showing the increasing value not only of the original art but also the value of a copy made of the penciled art prior to the inking process. 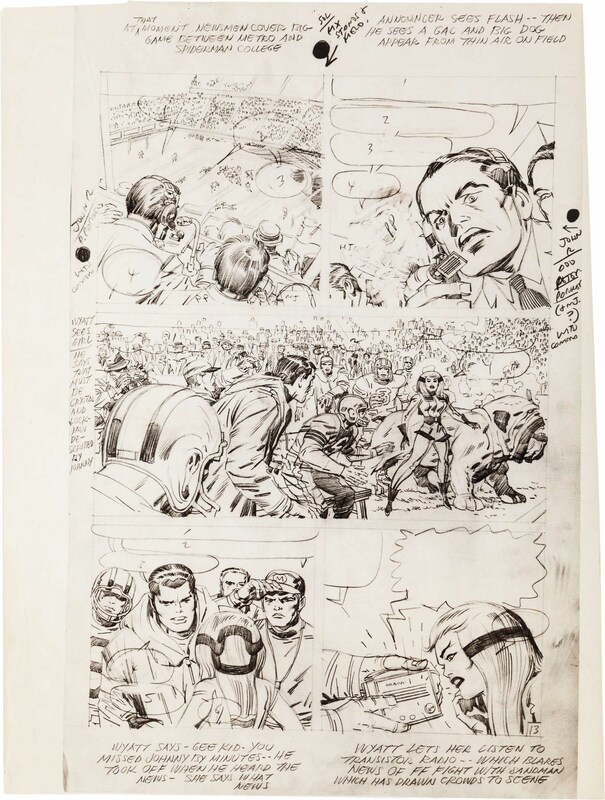 It is truly amazing to see Kirby’s original pencil art, because despite the attention of an inker as gifted as Joe Sinnott, there is something indescribable in the raw power and force of the King’s line that is wonderful to retain and also to compare with the beauty of the inker’s embellishment. Comparing an inked page to a penciled page is always an interesting and a revealing exercise. Joe Sinnott was one of Jack Kirby’s most popular inkers, known for adding a certain polish to what many considered Kirby’s rough edges. It is true that the inker has a lush style that often compliments Kirby art, but sometimes we see that despite his best intentions, Sinnott either weakens the force of Kirby’s lines or changes their emotional content. 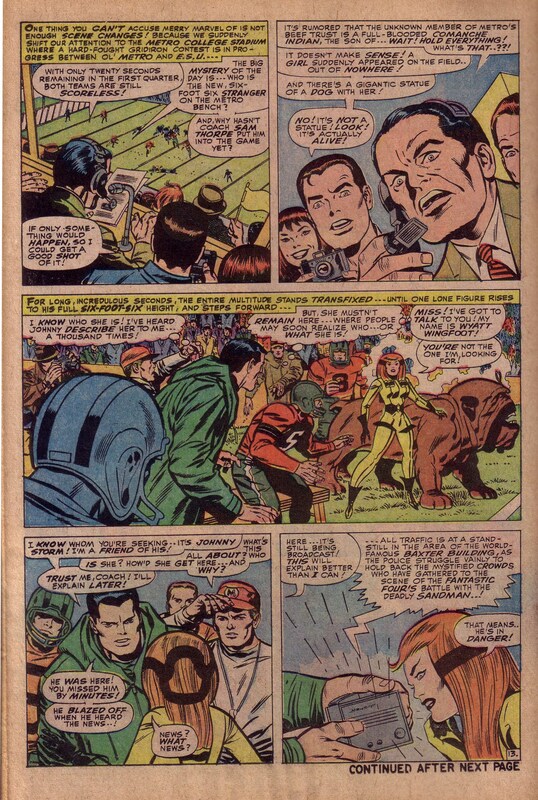 Looking at page fourteen of Fantastic Four #61, the former can be seen in the admittedly small figure of the Torch in panel three, where the translation of the inked form loses power in the set of his head on shoulder, in his right hand and in the right leg. This is not particularly a criticism of Sinnott, who is a professional journeyman with a crisp precise pen and brush hand. Among other things, he must certainly be applauded for lovingly inking every brick that Kirby has drawn over a five-year period. It is more to point out how the slightest variation in line quality can change its intent. Stan Lee, for good reason, loved what Joe Sinnott did to Kirby’s work. The inker had a particularly lovely way of refining the female face, but in some cases that refinement robbed the features of strong emotion. For example, if we look at the penciled Sue Storm’s profile, the expression is frantic, to emphasize her fear for Ben’s safety, whereas the inked version’s face is somewhat neutral. This combination of notes tells us that Lee and Kirby have planned to include a guest appearance of Spider-Man’s alter ego, Peter Parker, which we can clearly see when we look at the final printed page, since John Romita has indeed drawn Parker and girlfriend Mary Jane in that panel space. Although we do see subtle and some not so subtle alterations in the translation from pencil to art, we can really have very little to complain about here. These stories are among the very best to have appeared in the history of comics, and the combination of Kirby and Sinnott, despite or perhaps because of the latter’s facial embellishments are something wonderful that will be remembered fondly for generations to come.